So I've let my mind wander over to The Next Great Big RC Project of 2019. With the closure of my local onroad track (boo!) looming I'm kinda shying away from one of the exciting onroad cars that T has in the pipeline. While something like an M07 or a TA07 seems like a cool car to add to the fleet I'm afraid that I might just not have a place to run it anymore in a few months. A local housing developer has bought the plot of land on which our track is situated, and the adjoining hobby store had to move to a different location where, unfortunately, there's no room for a track anymore. Anyway, that's led me down the path of "what to build next...". I've never owned a monster truck, and I do have a lot of beach nearby which would provide for an ideal stomping ground. So, the Clod comes to mind. Yes, it's heavy, and in stock form a bit underwhelming, but it's iconic and it looks cool. Still plenty of them on uk ebay. I would be extremely bummed to hear the Clod was being discontinued. The Clod has a presence like no other vehicle that I have ever owned. I would highly suggest picking one up if you're concerned that they are going away. They are something that should be experienced and having been out for 30 plus years hopefully spares will be around for quite some time. This is what it says on Tamiya.de, the importer for Germany and The Netherlands, and that's what's gotten me concerned about the availability of Clods in the near future. I'll ask my local hobby store this Sunday to see if they can order one still, or if it's permanently out of stock at the importers. PS - would love to see a simple stock build of one of these Super Clods with just the kit supplied motors and ESC ( not sure which ESC it comes with?) - Iconic and cool is enough for most Tamiya's to be on the list. If you get totally stuck let me know and I'm sure I can help you out with shipping one from the UK to you. This was posted on TamiyaUSA's Facebook page this past Tuesday. 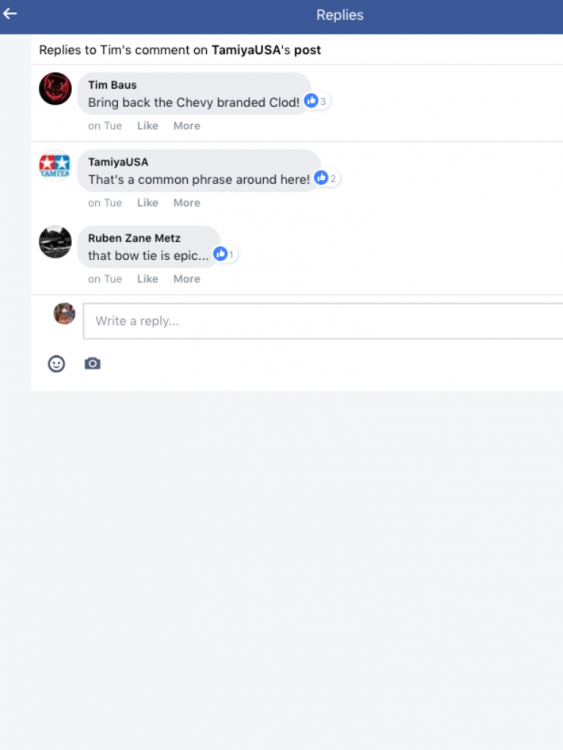 Interesting answer from the company when the Chevy-badged Clod is mentioned. Could this be a teaser for a proper rere in the future? A re-re with most of the original stickers and the parts molded in the original release's colours is conceivable, but I think a proper chevy-branded re-re is very unlikely. When you look at current 'new' models being released there's not a single GM product in there, I think. We had the Corvette C5 for a while in the early '00s, but no other Cadillac, Chevrolet, Buick or GM at all. If anything, GM seems to be affiliated with Protoform these days (They do a pretty mean ATS-V and C7 Corvette for on-road racers). 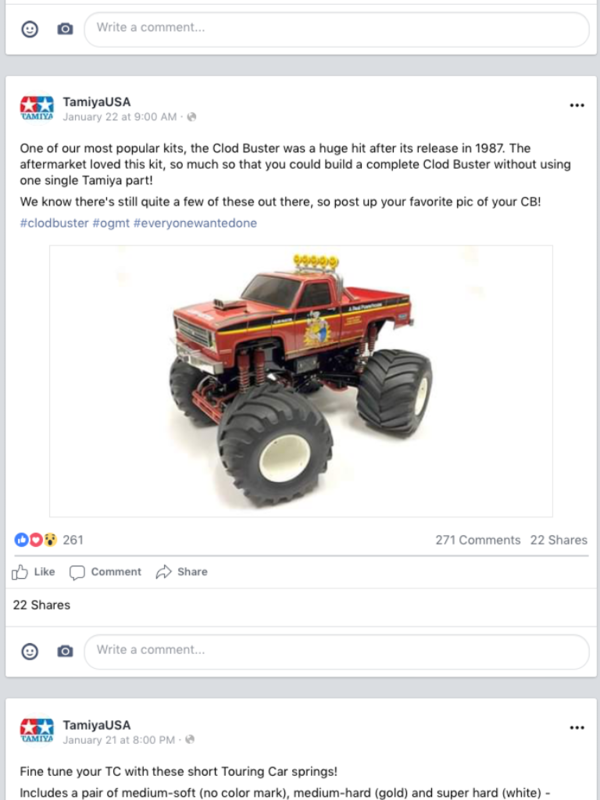 But since I'm planning to do a full retro-Clod (so red bumpers, repro 'correct' decals, small supercharger) and I know my luck, Tamiya will release a re-re OG Clod Buster months after I finish mine. Exactly, the last Chevy Tamiya cars which were actually licensed was the Corvette (2001), and Tamiya didn't license the Chevy S10 body when they recycled it for the XV-01T Asterion in 2012. I'm currently on the prowl for a second-hand Clod that's supposedly done up 'right'. I'm dropping by the guy's place tomorrow to check it out. Of course I'll post here if I do manage to snag the Clod. Was the Agrios supposed to replace the CB?